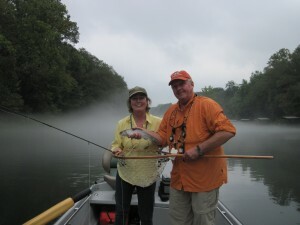 We had a wonderful day on The Little Red River with Kathy and Bill from Memphis, TN. There was a slow, gentle and much need rain last evening and this morning on the river it was foggy and very comfortable. Both Bill and Kathy are well traveled and experienced fly fishers and they caught a bunch of sassy Rainbows on #14 RG/PT Cruisers. Bo said that he had never seen anyone come tight on fish quicker and more efficiently than Kathy. When a trout took her fly it was for sure HOOKED-UP! All-in-all a really nice day with delightful people.